It may have taken me months to make the 184 fence posts and the 4 corners posts, but I bet you heard me cheer this afternoon when I finished pressing the final seam! 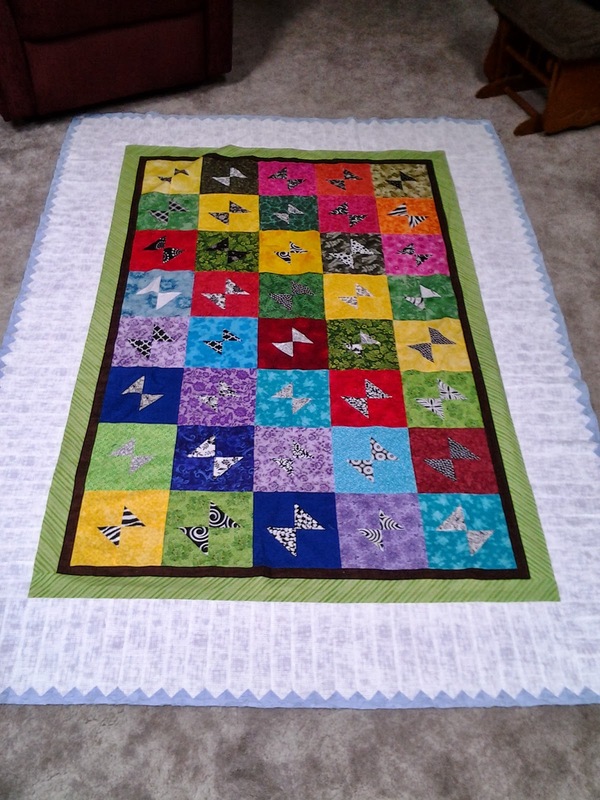 I spread my "Butterflies in the Garden" Block Swap quilt top out to admire! 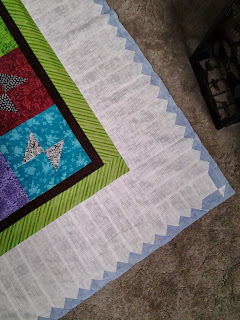 As you peeked into my sewing room this summer and watched the process develop in earlier posts, you saw that I drew a graph, figured the math, and planned for the white picket fence and soft blue sky, which will be finished with the blue binding. It took time to figure out all the dimensions and sizes for what I would need. Careful shopping helped me find the chocolate brown dirt edge for the garden, followed by a grassy green border and finally the picket fence. So, now my garden is ready for the next process of making a sandwich of fluffy batting and green grass backing and basting it all together! Stay in touch as I carefully work my way through quilting flitting butterflies and give dimension to this flat beauty!